Bach�s great motets are one aspect of the master�s work that is possibly the most underestimated. You may well already have a favourite recording from amongst the many that exist. I love a version by the Chamber Choir of Augsburger Domsingknaben, (the Augsburg Cathedral Choirboys). These are an all-male group directed by Reinhard Kammler (on Deutsche Harmonia Mundi RD 77031). You may well have one of the other eight versions available but this one is different> For a start it spreads out over a double CD set. It puts the motets into the context of similar pieces by Bach himself and by his contemporaries and members of his own family past and future. It�s a format which provokes thought and highlights some fine and unknown works. It also allows one to realize the greatness of these motets. They stand out from the rest like an illuminated capital letter at the head of an ancient manuscript. The motets are evenly distributed across the two discs. If you did want to play them right through, you would encounter a programme of interest and contrast. The motets were first performed in Leipzig. Their place in the service was generally immediately after the introductory organ prelude at the start of the service. 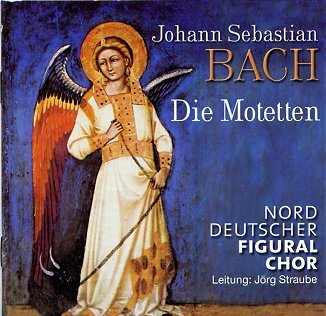 When commentators write that Bach was the last of the medieval composers they may well be thinking of the motet form and its total reliance on polyphony, in Bach�s case, on fugue. Although each is based on a chorale melody each has at least one fugal movement. Bach remarked in a memorandum in August 1730 that he expected about four or five to a part. Instrumental participation was acceptable, indeed even necessary to help tuning and add strength. Most recordings opt for continuo of some sort. I was involved in one performance some twenty years ago now, completely a capella. This new recording opts for a strong contingent of strings and continuo. As the booklet notes by Peter Wolliny, logically explain, "the vocal parts can also be replaced or reinforced by all kinds of instruments, this is confirmed by the instrumental material Bach used to perform his own motets". The notes divide the music up neatly into four distinct groups. These first set about describing the six motets and secondly the other six (shorter) motets by Bach, which are not part of the set. These are described as �stylistically related works�. Thirdly come pieces from Bach�s library. This accounts for one by Knupfer, and finally the apocryphal motets once attributed to J.S. These include the ones by Telemann which frame a brief motet by Bach himself. Amongst the intriguing and little known works explored by composers new to me is a fine motet based on the well known hymn �Nun Danket alle Gott�. This is by Bach�s son-in-law Johann Christophe Altnikol. In this the hymn only makes its presence fully felt at the end of the work�s compact six minutes. Similarly, Johann Wagner a pupil of J.S., is another, whose motet "Lob und Herr und Weisheit" starts off with a delightful folk-like melody then falls quickly into a rather learned fugue before ending with the chorale itself. Sebastian Knupfer, who became the Thomaskantor in 1657, is represented by a fine and solemn motet " Erforsche mich, Gott". This is in a homophonic style not dissimilar to early Schütz. So the music on this CD spans more than a century. Incidentally to hear Knupfer�s music performed by a small group with a significant instrumental accompaniment look out for Cantus Cöln on a marvellous disc �The Thomaskirk before Bach� (Deutsche Harmonia Mundi 05472 77203 2). I have to say at this point that despite the above-mentioned strengths and the interest these performances offer, I am not too impressed with the interpretation and final result. A list of the performers is given in the accompanying booklet, and one can count for example seventeen sopranos and eleven female altos. The choral sound is often beautiful, especially emphasising a legato effect. Sadly these performances lack a certain vitality. In �Jesu Mein Freude�, surely the highlight of the set, the result is mostly too slow, rather flabby and middle-aged. I feel the same about �Furchte dich nicht�. Surely the choir is too large for this music and not what Bach had in mind. Also disappointing is the fact that the double choir spacing needed for �Komm, Jesu, Komm� and for another eight-part motet �Der Geist hilft unser� is not strongly characterised. This is partly the fault of the recording, which could surely have helped. Equally however the conductor should have insisted on bringing across this significant feature. The booklet essay is well translated both into French and English and is certainly valuable. The texts however, some of which are a little obscure, are not translated. This is disappointing. My advice is that if you want a recording which puts these motets into their period context then this set might be enjoyable and fascinating. If you only want the Motets, then look elsewhere for performances which have that indefinably special something about them. For an intimate recording using size of ensemble Bach probably had in mind you could try the Scholars Baroque Ensemble on Naxos (8.553823) or the version for male voices I mentioned above.